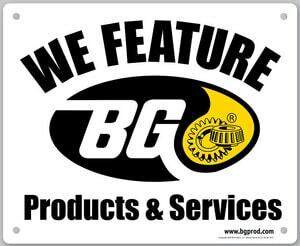 Not sure if you want to invest in a BG Automotive Maintenance Service? The Lifetime BG Protection Plan will help you make that decision. The high quality BG Automotive Maintenance Services listed below are backed by the Lifetime BG Protection Plan. That means, for example, if you get a BG Power Steering Service, repair of the lubricated parts in your power steering system will automatically be covered for up to $4,000! * How’s that for peace of mind with your investment? To maintain the lifetime protection, all you have to do is stick to the service schedule listed below! The Lifetime BG Protection Plan covers seven major systems: fuel, engine, transmission, drive line, cooling, power steering and brakes.